Are Movie Villains Scarier If We Don't Know Their Backstories? These days, every supervillain has a convoluted backstory. But are the most frightening movie villains those who show up already fully-formed, seemingly without motives or explanation? After looking at the comparatively tepid (and noticeably dragon-transformation deficient) storyline that the new Maleficent followed, a discussion began about whether the movie could have been saved by jettisoning some of the backstory. Or, in other words, couldn't a villain sometimes just be a villain? Someone in the io9 review commented that what happened to being evil just because? Since when do we need a backstory, why can't we leave well enough alone, why do we have to reduce an awesome character down to cliche backstories, tropes etc. And I completely agree. What makes Maleficent so great is that there is no apparent rhyme or reason to why she curses an infant (other than being snubbed an invitation to a Christening) and I'm perfectly okay with this. And also thank you for bringing up the Prince Philip subplot from the original! I had forgotten about it myself until the last time I rewatched it. Holy hell, Maleficent was not playing around. It's so much more fun to watch a villain reveling in her/his evil, and doing terrible things just for giggles, as opposed to watching the overused "misunderstood anti-hero" character mope around and eventually learn a lesson about how revenge is wrong. There's nothing wrong with humanizing a villain or fleshing out their motivations, but not all of them need to be like that. Sometimes they can simply be evil because that's what they choose to be. That's what made Maleficent such a threatening, awesome villain in the original. 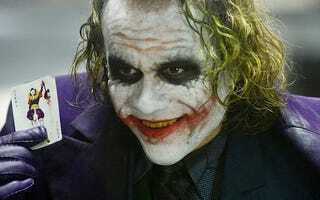 When Christopher Nolan talked about the Joker, he said he did not do an origin story because the Joker was supposed to be absolute: all evil, all chaos, and no reason. In my mind, Maleficent was the same...pure evil. I mean, she curses a baby because she was not invited to a party! So I wasn't happy with her origin story (As my friend said, they did a Vader on her, turned her form pure evil to a victim of circumstance). Perhaps if her origin story focused more on her and a lot less on Aurora (whom I found extremely annoying in this movie) just like they did with the Wicked Witch of the West in Wicked. What do you think? Should we movie-makers sometimes just skip the backstory for villains and present them simply as part of the story? Or do you want to know not just who they are, but how they got there? Tell us in the comments, along with some examples of stories that you think got it right.